reddish underside and multiple (2-3) roots on each plant. Dorsal view of the bisexual flower of Landoltia punctata. 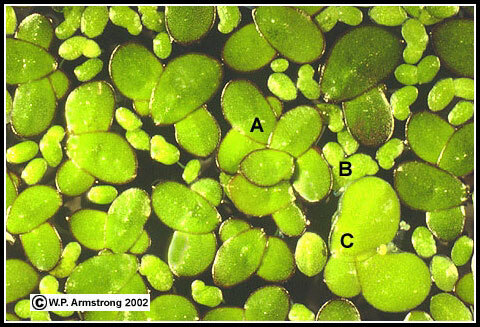 a dense population of duckweeds, mostly Landoltia punctata. 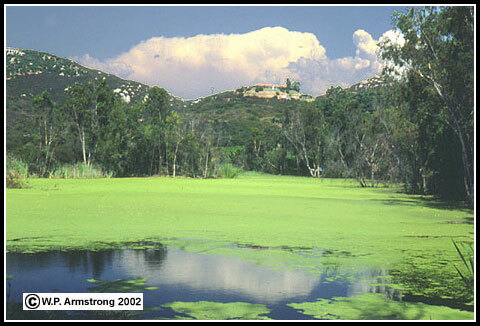 View of the surface of the Twin Oaks Valley pond showing two shades of green representing two distinct homogeneous populations of duckweeds. 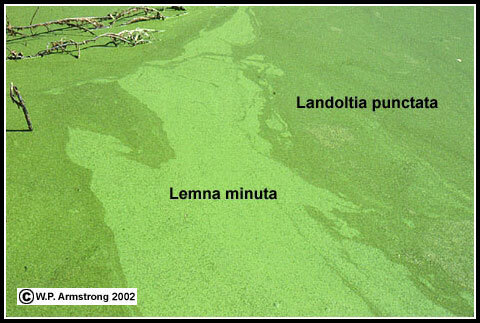 The dark green population is Landoltia punctata mixed with a light green population of Lemna minuta. Close-up view of the Twin Oaks Valley pond showing three different species of duckweeds: A: Landoltia punctata; B: Lemna minuta; and C: L. gibba in flower. Plants bodies of Spirodela are darker green and attached in clusters of four to six. Plants of Lemna minuta are much smaller, generally only 2-3 mm long. Lemna gibba is lighter green than Landoltia and distinctly gibbous (swollen) on the underside. Ventral side of a hydrated herbarium specimen of Landoltia punctata. A budding pouch in the parent plant bears a younger, daughter plant extending horizontally to the right in photo. 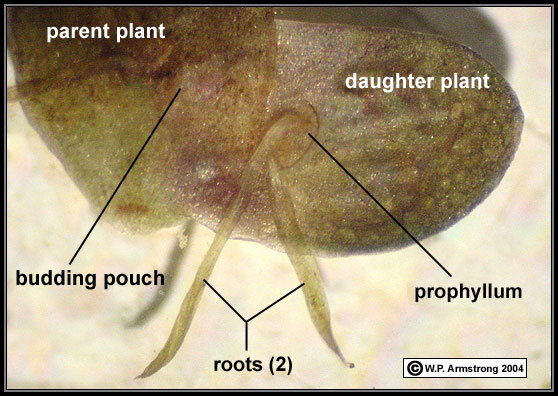 The daughter plant shows a scalelike prophyllum that is perforated by two roots. The ventral prophyllum is very difficult to see without careful examination under a dissecting microscope. A prophyllum is present in the genera Landoltia and Spirodela. 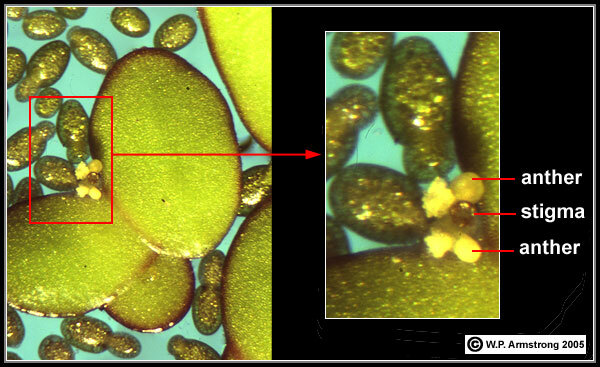 It is a membranous, scalelike leaf that envelops the dorsal and ventral surfaces of the basal end, but usually is not evident in older plants. The prophyllum portion and its connecting stalk are homologous to a condensed shoot that has become greatly reduced through evolution. More advanced genera, such as Lemna, Wolffiella and Wolffia lack a prophyllum.